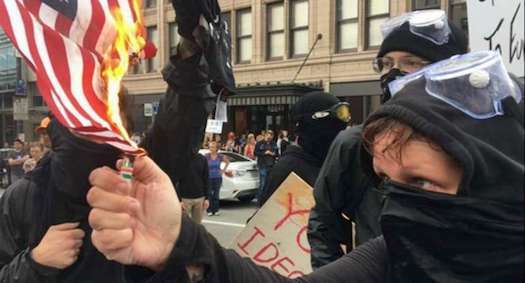 …”Antifa is a radical, anti-America, anti-free market, communist, socialist, hard-left censorial organization that tries to stop speakers on campuses from speaking,” Harvard professor Alan Dershowitz says. … He compared the movement to remove Confederate monuments to Josef Stalin, and accused the agitators of trying to rewrite history. … “The idea of willy nilly going through and doing what Stalin did, just erasing history and rewriting it to serve current purposes does pose a danger. And it poses a danger of education malpractice,” Dershowitz said. He compared the movement to remove Confederate monuments to Josef Stalin, and accused the agitators of trying to rewrite history. “The idea of willy nilly going through and doing what Stalin did, just erasing history and rewriting it to serve current purposes does pose a danger. And it poses a danger of education malpractice,” Dershowitz said. We wish those leftist fascists (irony alerrrt!) would self-destruct. But no, liberals, you cannot nor rewrite history, nor hide from the truth, nor hide your violent anti-Americanism, nor hide from your obligations — try as you might as you blame-cast, virtue-signal, lie, and obfuscate facts and truth. You own intellectual elite is on to you. “I’m a liberal, and I think it’s the obligation of liberals to speak out against the hard-left radicals, just like it’s the obligation of conservatives to speak out against the extremism of the hard right,” Dershowitz concluded. Especially, I think, when there’s at least 1000 times more of the leftist asses, and they have the support of the Democrats and the left-wing media.